I sometimes notice that I seem to go through periods of time when a theme emerges in my thrifting - finding matching, complementary or similar items, often from different shops. I don't think it's just me subconsciously picking up "pairs", as these are all things I would have bought even if they hadn't fit in with "this weeks accidental theme". 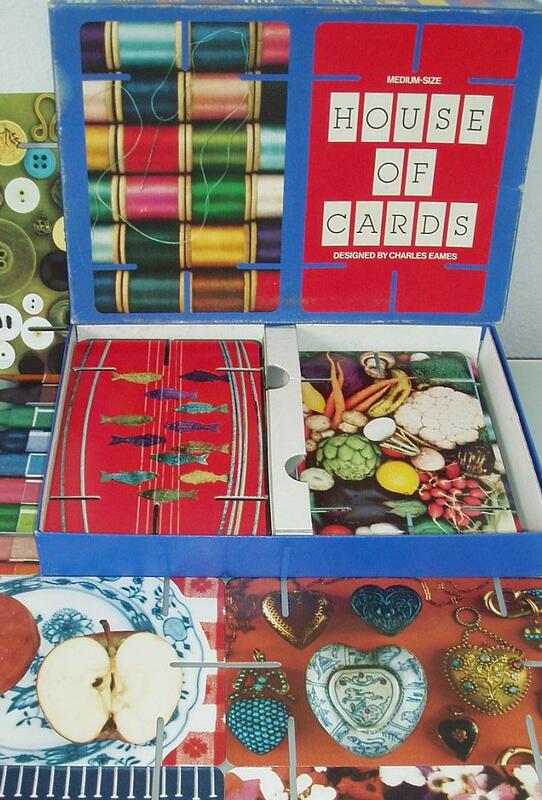 I was happily surprised to find this "House of Cards" set in the local hospice shop, priced at £4 and with only one card (the plain yellow one - I can live without that!) missing. The shop ladies must have had an idea that this was a bit special, as it was priced higher than all the other boxed games and jigsaws, but still a bargain. 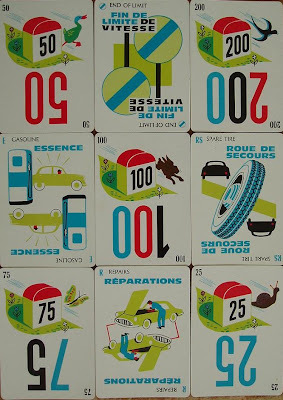 I do love a vintage game, especially one with strong, bright graphics. In spite of spending as many holidays as possible in France, this had somehow escaped my notice. 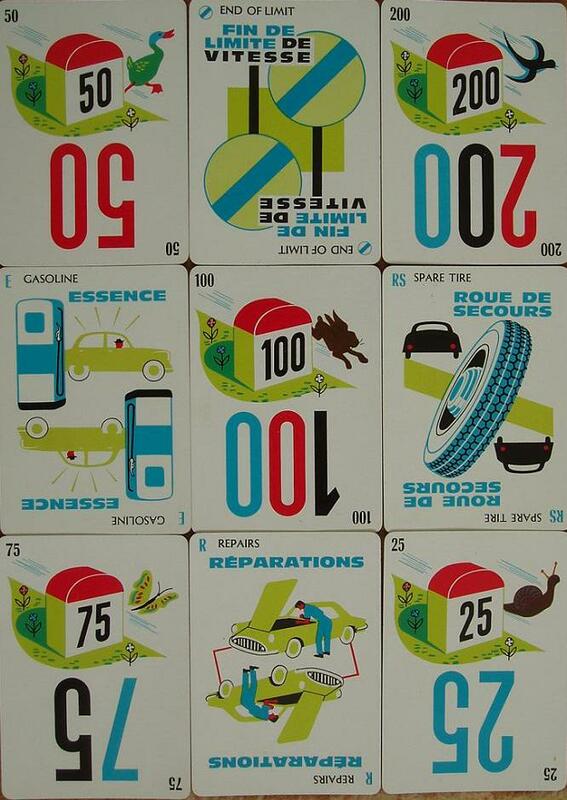 Apparently it's one of the essentials of a French childhood. A 50p bargain. 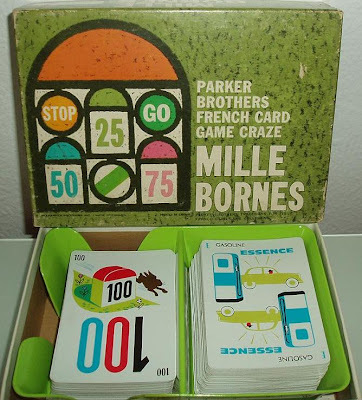 Just look at those cards! Aren't they wonderful! On an accidental "blue and white kitchenware" theme, I picked up this pepper shaker for 10p, and the coffee pot (or is it a tea pot?) for £1. 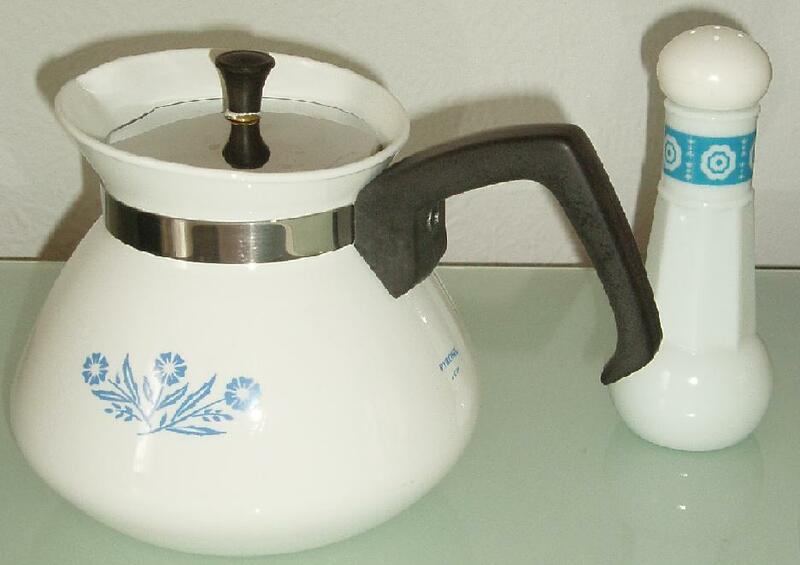 I had thought it was a coffee pot due to the shape being so similar to the old-fashioned Cona coffee pots I grew up with, but then found one on an American blog described as a tea pot. Maybe it's a US/Europe thing? The pepper shaker is an old Avon bath oil bottle with a specially designed top which you can turn into a shaker. I actually have some more of these with a different design, which I need to photograph. I'm sure they're 20 or more years old, and I can still detect a slight odour of bath oil, so I'm not sure I'd want to be putting salt or pepper into them. 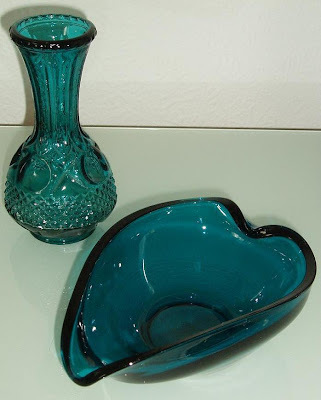 Finally, after years of collecting only green glass, and only certain shades of green, I had been finding myself becoming attracted to teal glass. Teal. Not blue, turquoise, aqua or any other shade - I'm funny like that. The little pressed glass vase was 50p, and reminds me of one Habitat had last year which ended up being reduced to something silly like £1.10 and I still didn't buy because it wasn't green. I have been kicking myself ever since. The dish was £1 and is a lovely heavy glass. @ Lea - yes, from doing a bit of Googling I think it is Corningware, it's marked "Pyrosil 6 cup". @ Vintage Scapes - I have to try to limit myself or I will run out of space! Aren't the illustrations lovely, seems a shame to keep them in the box, I may have a go at framing some. Hmmm, I'm Canadian and called this similar piece a teapot too, but I'm really not sure why. I actually just boil water in it and so I suppose it's really a kettle. I think in my family we always called things tea kettle, tea pot... Not sure why. great finds! 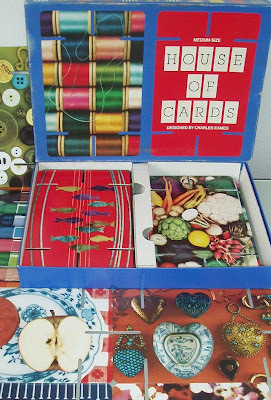 I like the card game. the graphics are cool. Love it! Teal is definitely a distinct shade. I could have teal everything I think...well almost everything. I dig the vintage game! Hello, I'm Canadian also. The Corning Ware is a teapot. We always had one in the 1970's and '80's. I recall there is a coffee pot but is taller and more slender. I still see then from time to time at thrift shops here. It always made a very nice cup of tea! I know what you mean about finding pairs. The past two weeks I found some vintage glasses in one color and then another color. I love it when that happens! OK, it's now officially a teapot! I will have to try it out, although in spite of us English being well-known for our love of tea, I hardly ever drink it, being a coffee-addict. I am also a sucker for vintage games. This one is so fun!! We used to play Mille Bourne and we enjoyed it. Never heard or saw, House of Cards. 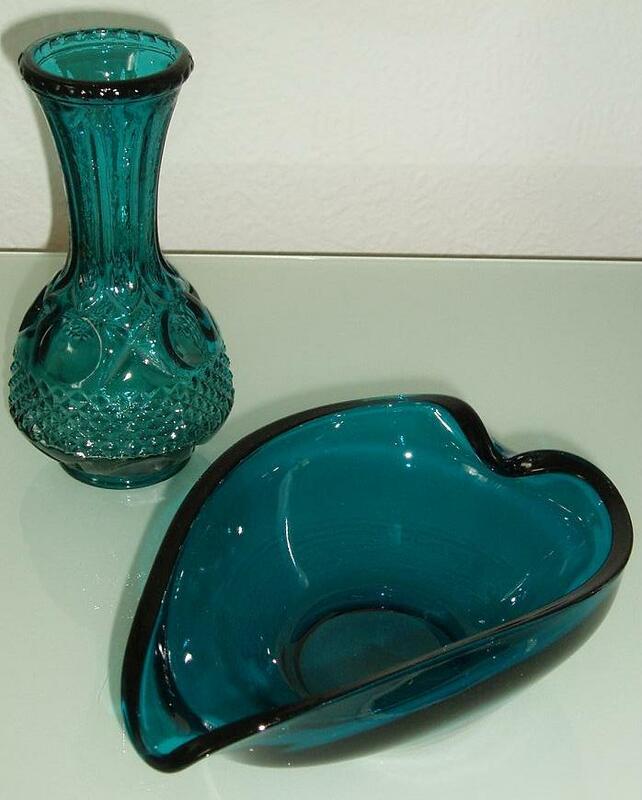 Corning Ware is so hot, I feel old now that things I grew up with in the 50's are so trendy...maybe I am trendy too? 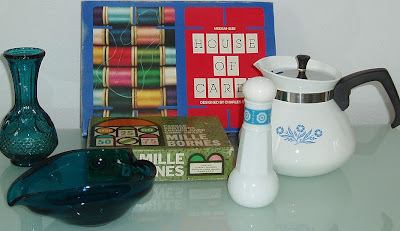 I often wonder if I am trying to rebuild my childhood bit-by-bit from charity shops. I definitely think that I am recreating scenes from my childhood. What can I say, life was great growing up, and there were lots of great quality items in the household at the time - better than some found in shops today!